I recently finished The Poisoner's Handbook: Murder and the Birth of Forensic Medicine in Jazz Age New York by Deborah Blum. I have mixed feelings about this book. The content is really interesting, but the writing and narration are sub-par. 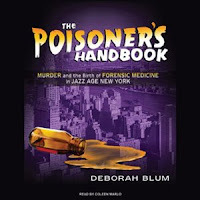 The book tells of the evolution of forensic science in murder investigations in NY city during the early 1900s under the leadership of the NYC's first trained medical examiner, Dr. Charles Norris. Real life stories are presented of murders committed using carbon monoxide, arsenic, radium, nicotine, chloroform, mercury, cyanide, aconite, silver, and thallium. I learned quite a few things from this book. For example, I learned that chloroform can be fatal and was once a popular tool for murder as well as being given out by doctors as a sleeping aid. At times there was too much details about window dressing items, as if the writer was trying too hard to paint a detailed portrait with an aim for empathy, or something. Also, I was annoyed with the female narrator's attempts to speak in a lower pitched voice when reading dialogue from a male character. If you're interested, you might read this review with excerpt at NPR. All in all, I won't listen to this audiobook again and I plan to give it to Goodwill.